In terms of the world’s most essential crops by production quantity, barley is ranked fourth amongst the cereals after maize, rice and wheat, although eleventh overall, and is widely grown across the world. Barley grain is used mostly as feed for animals, malt, and food for human consumption, malt being the second largest use. Farmers also use barley straw as animal feed in west Asia, north Africa, Ethiopia, Eritrea, Yemen, the Andes region and east Asia (Akar et al. 1999). There is a misconception that barley production does not contribute to food security. The importance of barley production as part of a crop rotation system should not be overlooked. 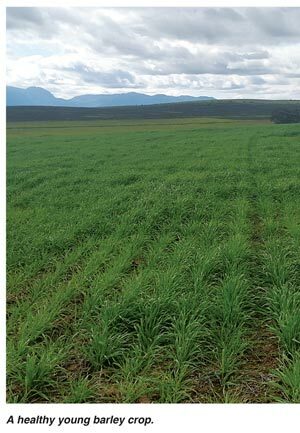 In fact, in the Southern Cape, barley production goes hand in hand with the production of other grain crops such as wheat, canola, oats as well as feed crops for animals like medics and lupins. It therefore directly contributes to the sustainability of our commercial and New Era farmers. In addition, the malting industry also creates thousands of job opportunities throughout South Africa which contributes to local economic development as well as household food security. Barley is a crop that is cultivated in both highly productive agricultural systems but also in marginal and subsistence environments. Its distribution is worldwide and is of significant economic importance for animal feed and beer production. The overall importance of barley as a human food is still minor but there is much potential for new uses. Barley’s ability to adapt to multiple biotic and abiotic stresses will be crucial to its future development and increased emphasis on these traits is needed to equip the crop for environmental change. Clearly barley is a resilient crop with much potential which can be realised in the future (Newton et al. 2011). It is clear that barley production does in fact contribute greatly to food security. It is imperative that we promote this very important industry and assist role-players to realise the importance of this commodity.